Organizers of the student research fair include (left-right): Cassie Liu, Pauline Xu, Constance Mietus, Laura Flores, and Stephen Haller. All five students are seeking MD/PhD degrees. The UNMC Chapter of the American Physician Scientist Association (APSA) will hold its second annual Research Fair on Jan. 9 from 3-5 p.m. in the Truhlsen Events Center on the first floor of the Sorrell Center. "The goal is to bring students and researchers together," said Constance Mietus, a Ph.D. candidate in the UNMC Department of Surgery and one of the organizers of the fair. "This event has traditionally been geared toward medical students, but we are expanding this year to welcome all students interested in research from across the campus." Mietus said undergraduate students from the University of Nebraska-Lincoln and the University of Nebraska at Omaha also will be invited. An interactive poster session will be part of the fair. "APSA believes that inside every physician is a scientist," she said. "However, finding the right research mentor can be a challenge for students interested in exploring research. For some students it can be overwhelming to find a project or area that speaks to them, let alone finding the researchers on campus who share those interests." "The APSA research fair simplifies the difficulties in identifying labs with projects of interest and provides students the opportunity to find research mentors from across UNMC," said Howard Fox, M.D., Ph.D., senior associate dean of research and development for the College of Medicine. "By bringing together a diverse group of scientists, we make networking possible between labs and talented students. 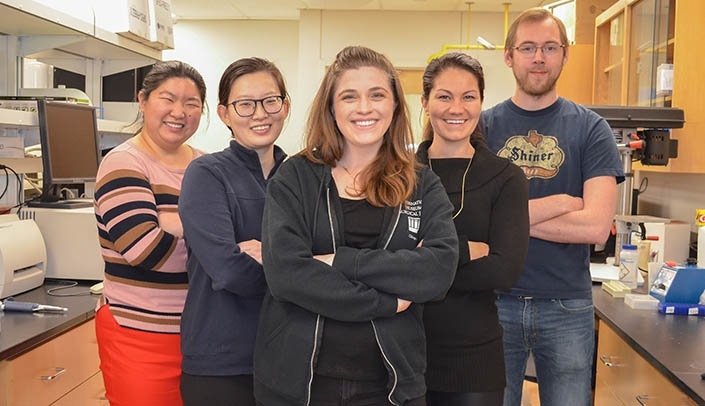 "Ultimately, labs have the opportunity to recruit outstanding students to help with their research projects, and students have the opportunity to engage in research -- a great win-win." The registration deadline for students is Dec. 21. To register, students need to complete this form. Mietus, who works in the lab of Iraklis Pipinos, M.D., Ph.D., professor, surgery-general surgery, and George Casale, Ph.D., associate professor, surgery-general surgery, said last year's research fair was successful with approximately 40 presenters and 70 students in attendance. She expects a strong turnout again this year. In a survey conducted this past summer, she said nearly all respondents reported that they did engage in research, and that the fair was helpful in finding a research mentor. "We believe the research fair will give students opportunities that they may have otherwise missed," she said. "By holding the fair on the first week of the spring semester, it should give students sufficient time to formalize mentorships and apply for programs and awards to conduct summer research."